The Scout ran his first meet of the season last Wednesday. He’s had a late start due to his fall on July 3rd and subsequent concussion. His head started hurting 2/3 of the way through the 5k last Wednesday, although he did well on Saturday at his second meet. Unfortunately, he had to come home early from school today with a headache that got worse as the morning went on, so he did not race in today’s meet. After taking a 3-hour nap, he and SuperDad went down to watch and cheer on the team, however, because that’s what they do. My understanding is that there really isn’t anything you can do to hurry up the healing from a concussion, but he’s got an appointment with the doctor in 2 weeks to discuss his progress and setbacks. His first (but not last!) 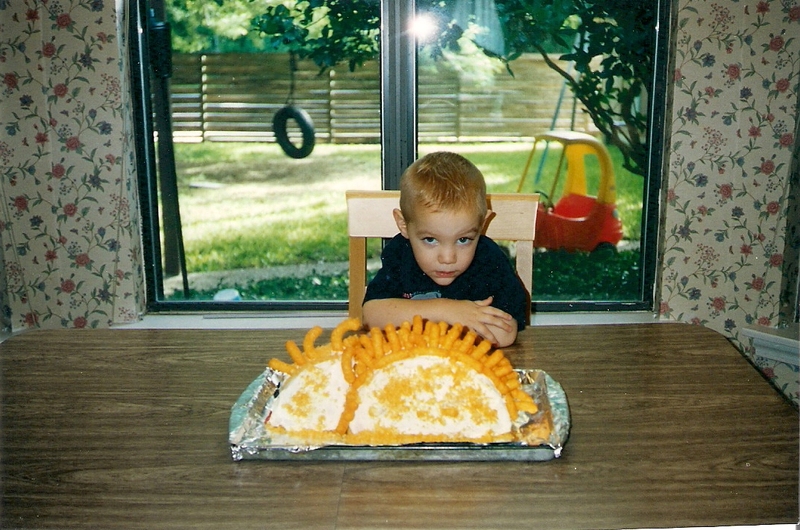 Cheesy-Puffasaurus birthday cake. And although he doesn’t show it in this photo, he was actually very pleased with his cake. At 17, The Scout does not want a birthday cake or even a birthday pie! This is because he decided back in January to kick excess sugar out of his diet. ** He is leaving in a few hours for a week of Boy Scout camp, so this morning I made him an omelet with sauteed fresh vegetables for his birthday breakfast. 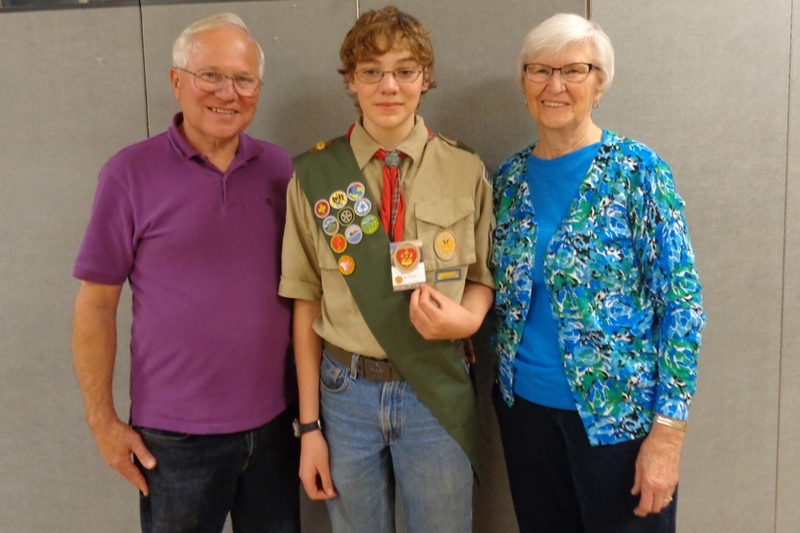 An older picture of The Scout and his grandparents. He’s at least 3 inches taller now. Last weekend at his grandparents’ house, where we were celebrating his grandfather’s 80th birthday, The Scout and his brothers H-J and The Barefooter each made their own veggie omelets for breakfast. They are no strangers to presentation value, garnishing with an artistic squiggle of ketchup and sides of sliced melon. Extended family was impressed. 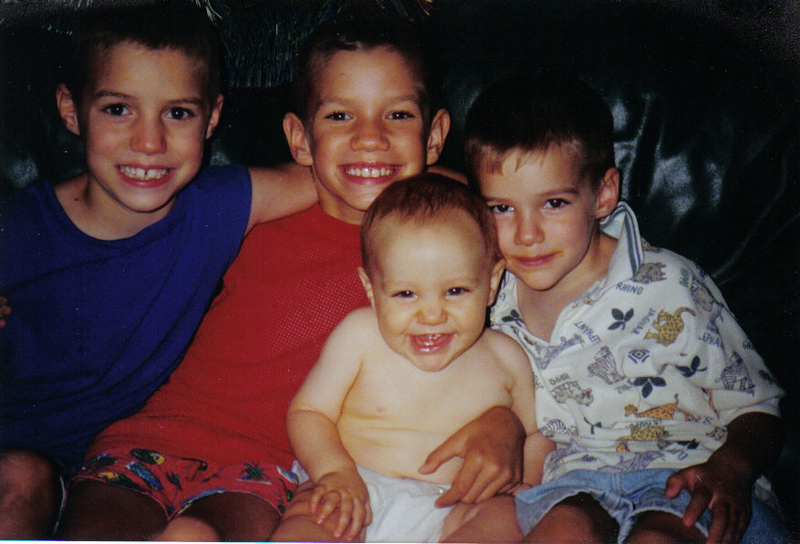 My four boys, summer 2000. Last Saturday was the first time the four of them had been together since the week of Christmas. Today that sweet one-year-old baby turns 17 years old. A week of scout camp may be a challenge for him as he continues to have headaches, but he tells me that it has improved and no longer feels like someone is pressing a hot iron into his scalp! My resident teenager doesn’t complain — just quietly goes about doing what must be done. I’d worry about him going but SuperDad is his Scoutmaster and, as you may recall, is a retired nurse. Our house is generally pretty quiet; this week it will be too quiet. ** That’s right, my teenager does not eat candy or cookies or other sweet treats. He eats fresh fruit when he wants something sweet. This is totally his choice, and it fits with his generally healthy lifestyle. If given a choice between whole grain crackers and potato chips of any flavor, he’d choose the crackers. We haven’t had ice cream in the house for more than a month (and even then he wasn’t eating it). I’m proud of him for choosing healthy fuel for his body; at the same time, I’m pretty sure he’s not a normal teenager. Pokemon GO has invaded my world — or rather, my husband’s world. He took a walk before turning in for the night to drop off one of his Pokemon at the nearest “gym.” He’s having such a fun time. I’m trying to listen and smile. Back on July 3rd, The Scout fell out of a tree. He’d been climbing and a branch broke, plummeting him 23 feet to the ground below. He landed on his back. It hurt — a lot. He managed to walk home (collapsing from pain at least once) that evening and miraculously exhibited no damage on the CT scan. It’s been 12 days since he fell and he’s still dealing with headaches, backache (obviously) and inability to do most activities. He has an appointment with a doctor this morning. I’m a bit worried about the upcoming week (end of the month) at Boy Scout camp with its faster-paced activity level and noise level. After 5 Fridays in a row at the farmers’ market, I’m taking a “family day” break. What’s happening these days in your household? For those that guessed a cut cable, you are correct. Our resident teenager rode his bike 2 miles to the school on graduation Saturday, locked it up and walked the next mile to the event center where the band was playing for graduation. For some reason he didn’t think there were any places to lock up a bike at the opera house (there are — in the parking garage, where he didn’t think to look). Three hours later, he returned to a cut cable, no helmet, no bike. He walked the three miles home and silently showed us the remains of his transportation. It wasn’t a new bike — I had purchased it in 1989 and it had a busy life for the past 27 years — but it was solid, reliable transportation. That’s me in the photo above, circa 1989, riding on the farm; in the photo below, I’m preparing to haul 100 pounds worth of offspring in Germany, circa 1997. I miss that younger, stronger version of me and the fun of living on the outskirts of Heidelberg. It is frustrating be minus a bike, especially for a 16-year-old who merely wanted to save gas money and parking fees, which is why he didn’t drive his truck that day. Driving would have been easier — have you ever biked with a trumpet? But we raised out kids in a frugal lifestyle and it has successfully passed down to the next generation. Of course, we reported it stolen, but in a city with a population of 200,000 people, we don’t expect to see it again. Our kind next door neighbor has gifted us one of their bicycles: 10 years old, ridden once. It’s a little short for The Scout but it’s a thoughtful gift and the price was right. Please leave your best detailed guess in the comments below.